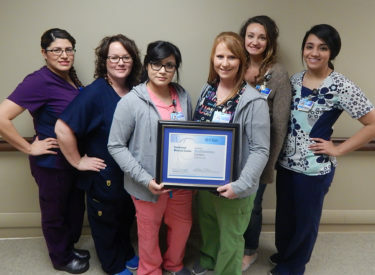 In an effort to help prospective parents find hospitals that deliver quality, affordable maternity care, Blue Cross and Blue Shield of Kansas announced Southwest Medical Center has been re-designated as a Blue Distinction Center+ for Maternity Care. Blue Distinction Centers are nationally designated hospitals that show expertise in delivering improved patient safety and better health outcomes, based on objective measures that were developed with input from the medical community. The Blue Distinction Centers for Maternity Care program evaluates hospitals on quality measures for vaginal and cesarean delivery. To receive a Blue Distinction Centers+ for Maternity Care designation, a hospital must also meet requirements for cost efficiency. Since 2006, the Blue Distinction Specialty Care program has helped patients find quality specialty care in the areas of bariatric surgery, cancer care, cardiac care, maternity care, knee and hip replacements, spine surgery and transplants, while encouraging health care professionals to improve the care they deliver. Research shows that, compared to other hospitals, those designated as Blue Distinction Centers demonstrate better quality and improved outcomes for patients. On average, Blue Distinction Centers+ also are 20 percent more cost-efficient than non-Blue Distinction Center+ designated hospitals.